When Sean McVay stepped up as head coach of the Los Angeles Rams in 2017, he became the youngest coach in the history of the NFL. He proved to be a winning coach right from his first game. But it’s his life off the field that caught our attention, particularly the relationship with his gorgeous girlfriend, Veronika Khomyn. Sean McVay made the move to California when the Los Angeles Rams appointed him as head coach, making him the youngest head coach in the NFL. The 32-year-old was named Coach of the Year by the Pro Football Writers of America in 2018. Not only are his coaching abilities turning heads, but so is his dating life. People are becoming increasingly curious about Sean McVay’s girlfriend and his new home. His girlfriend, Veronika Khomyn, can no longer fly under the radar. Our Veronika Khomyn wiki turns the spotlight on this fabulous WAG. Born Veronika Nikolaevna, Veronika Khomyn is a native of Ukraine. She lived in Virginia where she went to George Mason University in Fairfax. Khomyn worked at UFC Gym and DC Clubbing in Fairfax. But she also has experience working as a model. McVay was the offensive coordinator for the Washington Redskins. Khomyn and McVay shared a home together in Virginia. After he was hired by the Rams, she moved with him to Los Angeles. McVay purchased contemporary-style house in Encino Hills with a price tag of $2.7 million, and it was all the Internet could talk about. The home was decorated by McVay’s professional interior designer mom, who has very expensive taste in furniture. When McVay got the job with the Rams, he was hoping to return to his townhouse in Virginia to gather his things. But there was so much to do in L.A. and he didn’t have the time to travel back. No worries though! Khomyn came to the rescue! She gathered her friends and took care of clearing McVay’s townhouse and managed to sell it in a day. So, McVay didn’t have to head back to Washington! McVay and Khomyn’s house has become a hot topic since McVay’s mother, Cindy McVay, has done a fabulous job in decorating it. She handed her son a pretty huge bill for her services, too, with no family discount! According to Khomyn, McVay’s favorite part of the house is using Alexa to turn the lights off and on. McVay had no idea that his home was making the Internet go wild until his girlfriend told him. Khomyn is social media savvy and boasts an Instagram follower count of over 15.3k. The Rams coach may not have social media, but he’s not camera shy! They love showing their affection in Khomyn’s Instagram pics. From Veronika Khomyn’s Instagram, we can see that she’s pretty well-traveled. She has some picturesque photographs from Ukraine, Austria, France, the Caribbean, and even Miami and Malibu. But she recently turned her Instagram to private, probably because of criticism she received for following a certain NFL personality. In June, Khomyn followed Jimmy Garoppolo, the San Francisco 49ers quarterback and rival to McVay’s team. Frankly, it’s not a big deal. Khomyn is free to follow whoever she wants on Instagram. But she received some flak from Rams fans nonetheless. The animal lover, however, maintains an Instagram account for her beloved dog, Fawn. She is a one-year-old carefree pit bull. Fawn was even trained for two weeks at a dog disciplining school and takes naps in style. Khomyn enjoys football, and not just because her boyfriend is in the league. 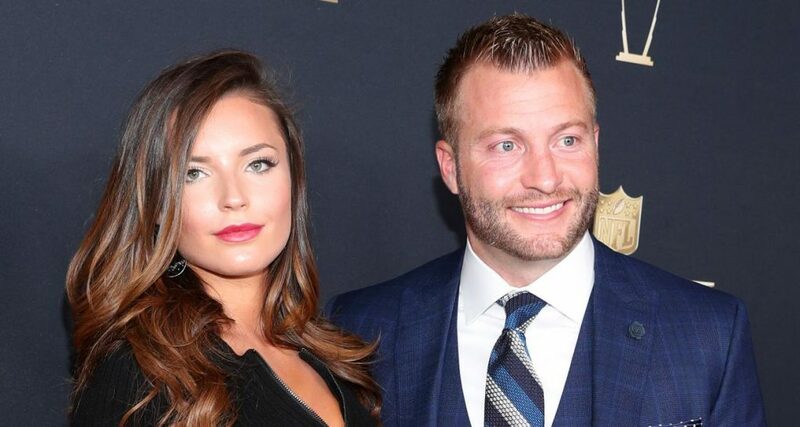 According to some of his interviews, Sean McVay discusses work with his girlfriend. Obviously, Veronika Khomyn has some fair knowledge about plays like her beau.